There is some more “Metro bonanza” in store for Delhi and NCR neighbourhood. The Delhi Government today decided to appeal before the Supreme Court-appointed monitoring committee on sealing for a halt on the MCD drive till January 31, 2007. The sealing issue led to unruly scenes in House meeting of the MCD held today after BJP councillors alleged that the Congress was not taking it ‘seriously’. With four cases of polio reported in the Capital, Chief Minister Sheila Dikshit today said the Pulse Polio vaccination programme would be reviewed to check the recurrence of the disease. The Delhi Government today announced to make arrangement for Haj pilgrims of seven states, including the national Capital. The states are Uttaranchal, Haryana, Uttar Pradesh, Punjab, Himachal Pradesh and Chandigarh. The Haj pilgrimage is to begin from November 22. With the arrest of five persons Amar Singh, Madan, Rajesh, Bunti and Sanjay from Maurice Nagar area, the North district police today claimed to have busted a gang of dacoits, while they were planning to commit dacoity in a bus in the Capital. The annual Phool Waalon Ki Sair festival, organised to promote communal harmony in the country, will be held here from November 2 to 4. The four-day festival of ‘Chhath’, observed by the people of Bihar, Jharkhand and Eastern U.P began today. The Delhi University (DU) will confer a honouris causa degree on Amitabh Bachchan at a special convocation on November 4 for his contribution to the Indian film industry. At least seven polio cases have come to light in Haryana till date this year as compared to no case of this kind last year. Out of the seven reported cases in the state, one is from Faridabad. This was revealed in a report prepared by officials of the World Health Organisation (WHO), who claim improper cleanliness and sanitary conditions were behind the survival of the polio virus. The Greater Noida Industrial Development Authority (GNIDA) has come out with a scheme for the allotment of industrial plots as also for the IT sector. The Kavi Nagar police here arrested a “vigilance officer” masquerading as a journalist undertaking sting operations with the aim of blackmailing people. A wireless set, a scooter and some other gadgets have been recovered from him. He has been sent to jail. After Divali, the sudden change in weather has already brought a new set of ailments — viral fever, sneezing, bad throat, body aches etc. Suspected dengue patients, who tested negative, but whose platelets are falling could be patients of chikungunya, according to doctors. Most such patients in hospitals have been put on ventilators. A young man was badly charred in Sector 51, Kendriya Vihar, developed by the Noida Authority for employees of the central government, when he came in contact with an 11,000 volt, high-tension wire yesterday. He got severe burns in the head, hands and stomach. There is a proposal for a brand new Metro link between Central-Secretariat and Badarpur at the Delhi Border. The link, awaiting a green signal from Council of Ministers, is likely to be included in the Phase-II and completed before the 2010 Commonwealth Games. The expansion proposal has already been cleared at the secretary level and will link areas like Khan Market, Jawahar Lal Nehru Statdium, Lajpat Nagar, Tuglakabad and Badarpur at the Delhi Border soon. The same line will later be extended till Faridabad. Meanwhile, the Delhi Metro is all set to begin services on the Barakhamba Road- Indraprastha section next month, thus linking the faraway Dwarka to the heart of the city, well ahead of schedule. The Barakhamba Road-Indraprastha extension Line will be opened for public from November 10, in time for India International Trade Fair at the Pragati Maidan. Speaking to mediapersons after taking the ride, Delhi Chief Minister Sheila Dikshit said more than a million of travelers were expected at Pragati Maidan every year for whom the Delhi Metro would prove to be one big boon. Ms Dikshit traveled between Mandi House to Indraprastha station on the Metro on a rather slow ride that took almost 30 minutes. With the first phase spanning 65.1 km completed, the Metro will now extend its services to East Delhi and Noida. The Barakhamba-Indraprastha section has the country’s first ‘extra dosed’ bridge over the railway crossing spanning over 93 meters and does not have any piers to support it. The newest section is yet to be cleared by the Commissioner for Metro Railway Safety. Metro is expecting 25,000 persons to commute on this route daily and the ridership is likely to increase to 42,000 once the section extends to Noida by 2009. DMRC Managing Director Sreedharan said there were some differences between Delhi and Uttar Pradesh governments over the Noida route that were hampering work on the extension line. “All the preliminary work on this line has been completed. But the Uttar Pradesh Government is yet to provide land,” Dr Sreedharan said. The DMRC expects this section would be a major profit earning area. The Barakhamba-IP section got the preference above the Rohilla section for its economic feasibilty. Dr Sreedharan said that the DMRC asked the government to give priority to this section against the Rohilla section. The Barakhamba Road–Indrapratha section is 2.81 km long. While the Mandi House station is underground, the other two are elevated. The Metro trains will travel from the underground to the elevated section over a 330- m long ramp at Sikandra Road. This is the second ramp constructed by Delhi Metro. The Delhi Metro will make special arrangements to facilitate the movement of visitors to the India International Trade Fair (IITF) at Pragati Maidan which is to start on November 14. This decision was taken in view of reports that the three-day bandh called by traders from October 30 could create a serious law and order situation. The Delhi Police has also indicated that there were chances that the bandh could turn violent since it was spread over three days and there was always a likelihood of the force being spread thin over the huge metropolis. The Delhi Police has sought additional force for the three-day bandh. Delhi Chief Minister Ms Sheila Dikshit called an emergency meeting of her Cabinet, in which it was decided that the government will ask the court panel to take a considerate view of the 41,000 traders who have filed affidavits for voluntary closure of their establishments, sources said. The government will ask the monitoring committee for putting a halt on the sealing drive till January 31, 2007, by which time the Master Plan for Delhi 2007 was likely to be implemented, they said. While the court-ordered sealing drive against commercial units in residential areas is set to resume on November 1, the traders have decided to go in for a three-day bandh starting from October 30 to protest against the MCD action. “We keep meeting to find an amicable solution to the sealing issue. We are trying all possible ways to provide relief to the people though finding a solution is tough,” Ms Dikshit said when asked about the Cabinet meeting. The Group of Ministers (GoM) set up by the Centre on the issue is meeting here tomorrow and again on Saturday. “We are co-ordinating with the Central government, the MCD and traders to sort out the matter,” Ms Dikshit said. The traders’ bandh against sealing on September 20 had turned violent, with five persons losing their lives in the violence in the Seelampur area of East Delhi, prompting the Centre to urgently constitute a GoM headed by Home Minister Shivraj Patil to find a solution to the problem. They alleged that the sealing was done on the direction of Congress president Ms Sonia Gandhi. This allegation made the ruling party councillors angry and they came into well of the House and broke the mike of the Leader of Opposition, Mr Subhash Arya. When the Mayor, Mr Farhad Suri, could not pacify the councillors, he adjourned the House. The House again assembled and decided to have a special House on November 6 to discuss the sealing issue. Meanwhile, a delegation of Delhi Pradesh Congress Committee today met the Lt. 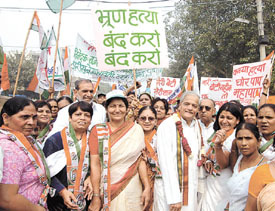 Governor of Delhi, Mr B. L. Joshi, and urged him to ‘use’ his executive powers for the implementation of the Delhi Master Plan 2021 before January 31, 2007. After the meeting, which lasted about 20 minute, DPCC chief Ram Babu Sharma briefed the media saying that the Governor was apprised of the unrest brewing among the traders who had filed affidavit with the Supreme Court for voluntarily closing their shops currently being run in residential areas. “We have requested the Lt Governor to use his constitutional and executive powers for the implementation of the Delhi Master Plan 2021 before January 31. It would give relief to around 90 per cent of the trading community,” he said. He was accompanied by MP Jagdish Tytler and others. In a two-page memorandum submitted to the Lt Governor, who is also the member of the Group of Ministers on sealing, the DPCC requested him to allow the 41,000 traders, who had complied with the Supreme Court order to file affidavits, to carry their business activities from next month till the implementation of the Master Plan 2021. The Governor was also urged to push for “amendments in the Ninth Schedule of the Constitutions to provide maximum relief to the traders and ensure that 2183 streets notified by the Delhi Government are kept out of the ambit of the sealing drive”. Claiming that the Congress support the traders’ stand on the issue, Mr Sharma said the DPCC would soon meet every member of the GOM to drive home their point. “In the evening we are meeting the Chief Minister on the issue,” said Mr Sharma. “Four polio cases have been detected and we will review the programme to check the recurrence of the disease,” Ms Dikshit told reporters on the sidelines of a DMRC function. The large number of transit population in Delhi is also responsible for the recurrence of the disease,” she added. “Large populations move to and fro between Delhi and Uttar Pradesh and Bihar which remain a major source of the virus,” Ms Dikshit said. Three of the four polio patients—two-year-old Sheikh Ashraf from Jahangirpuri, one-year-old Shivender from Badarpur and eight-month-old Sameer Ali from Okhla—have a history of travel to Uttar Pradesh and Bihar. The fourth patient is one-year-old Jannat, who had received nine doses of the polio vaccine. A senior official of the Delhi Government said that about 16,000 pilgrims will gather in Delhi and all arrangement will be made by the Delhi Haj Committee governed by the state government. One countrymade pistol, one button-controlled knife, cord and iron rod have been recovered from their possession. Acting on a tip-off that some desperate criminals armed with countrymade firearms and knives would assemble opposite Sri Ram Institute, Maurice Nagar, with the intension of committing dacoity in a bus, they were apprehended. They had been residing in the same area for a long time and involved in criminal cases, said a police officer. During the festival, people from different communities and states present ‘pankhas’ decorated with flowers at the dargah of Sufi Saint Khawaja Qutubdin Bhaktiar Kaki (RA) and the Yogmaya Devi Temple in Mehrauli. On November 2, the festival will commence with the Lt Governor, Mr B L Joshi, offering a floral ‘chaadar’ at the Dargah and the temple, according to event organisers Anjuman Sair-e-Gul Aaroshan. The word Chhath means ‘sixth’ in English. It starts on the sixth day of Divali, which also happens to be the sixth day of the month ‘Kartik’. The festival essentially involves ‘purification’, in both the physical and spiritual sense. Chhath is also known by the name of ‘Suryashashthi’. As the name suggests, the festival is celebrated to pay obeisance to Sun God, in the belief that the devotees get rid of their sins and their desires are fulfilled. Usually, married women and men observe the festival. The first day is known as ‘nahay-khay’ (eating after a holy bath). It signifies purity. By this day, the devotees, who are to observe Chhath clean their houses. They go to the bank of the Ganges or any other water body in their vicinity and take a dip to get rid of their sins. They also sprinkle water of the holy Ganga in their houses. The day not only signifies physical purity but also mental purity. They eat cooked rice, chana dal, and gourd (‘lauki’). The second day is ‘kharna’. On this day, the devotees fast without consuming water till the evening. In the evening, they have a meal comprising puris, rice and jaggery cooked in milk. The devotees serve this food to their family and friends, who turn up at their houses. On the third day, devotees observe fast for 24 hours without consuming water. In the evening, they go to river banks, take a dip and offer arghya (sacred water containing fruits and sweets prepared at home) to the setting sun. After offering their prayers to the setting sun, they either return home or, wait till dawn on the ghat (river bank). The devotees visit the same ghat the last day. This time, they face the eastern direction and offer arghya to the rising sun. After paying their gratitude and obeisance to sun, they drink water and have prasad (offerings made to sun). Unfortunately, nowadays, people try to observe this ancient festival at home itself. They construct small pools of water on the roofs or stand in deep utensils filled with water to offer prayers to sun. Noted cartoonist R K Laxman, Principal Scientific Adviser to the Prime Minister C N R Rao and Delhi Chief Minister Sheila Dikshit will also be presented the degree at a special convocation on November 4, a DU officials said. These awardees will be presented the degree in recognition of their work in their fields. The university will also honour historian Romila Thapar, industrialist Ratan Tata and prominent writer Mahashweta Devi at the convocation to be held later, officials said. At a function held to dwell on measures being taken with regard to the pulse polio programme scheduled for November 12, the WHO Surveillance Officer, Dr Sachin Rewaria, said nearly all polio cases reported in Haryana were from the districts bordering the Yamuna. Unclean and unhealthy surroundings besides the heavy density of population in a particular area were responsible for the disease. The WHO official, who was at a meeting of the taskforce set up for the pulse polio drive, revealed Bulandshahr district in Uttar Pradesh had one of highest number of polio cases with the figure touching a whopping 60 out of the total number of 416 cases reported in the entire country during this period. He said India, Pakistan, Nigeria and Afghanistan were the only four countries in the world where polio was still to be eradicated completely. He said this task was possible only if the government machinery and NGOs involved in the awareness and immunisation campaign ensured the root cause of the disease was wiped out and every citizen was sensitised. The focus had to be on the availability of clean water and healthy living conditions. Dr Rewaria asked officials working for the programme to ensure that every house in the district was covered in the programme. The authorities concerned decided to engage the services of bodies like the Nehru Yuvak Kendra, the NCC, Scouts and Guides, students of the colleges, nursing schools and other social organisations to cover the target group in the drive. The Additional Deputy Commissioner, Mr Sanjay Joon, directed the premises of private and government educational institutions should be used for administering pulse polio drops. Also, mobile teams in rural and remote areas should be made available. The application forms for registration will be available from October 30 at the Bank of Baroda. The applications are to be deposited with the Customer Relations Cell of the GNIDA. The allotment will be made to industrialists who ensure jobs for the local, unemployed youth. Vivek Kumar, alias Vivek Sant, is a resident of Nyay Khand, Indirapuram, and his father is a political leader. The SO, Kavi Nagar, said Vivek had cheated Kuldeep a Home Guard, of Rs 500 after threatening to initiate a probe against him. He made a demand for Rs 1,000 but the Home Guard paid him Rs 500 with the promise to pay the balance amount later. A suspicious Kuldeep told his story to a confidante of the SP, City, who instructed the SO, Kavi Nagar, to investigate. The SO, Kavi Nagar, arrested Vivek from Sector 23, Sanjay Nagar, where he had called Kuldeep with the bait of paying him the the remaining amount of Rs 500. The police recovered a wireless handset belonging to Rajveer Singh Bhagor, in-charge of the Niti Khand police post in Indirapuram. Rajveer is currently posted at the Mussori police station. This wireless set was lost in Indirapuram last year. The CO II said Vivek had worked as a reporter for small newspapers and a TV channel. He had been masquerading as an Intelligence Bureau or CBI officer, sometimes even posing as a TV journalist. He had cheated and defrauded a number of persons. He frequently carried a wireless set while extorting money from people. He had managed to hoodwink policemen, too, who never suspected him. Armed with a video camera, he would sometimes give the impression he was carrying a sting operation, the CO said. More than 24 such patients are under treatment in three major hospitals here. The hospital administration is hesitating to report such cases to the CMO in spite of negative serology reports for dengue. The platelet packs are, however, being reinforced in patients with falling platelet count. His father, who tried to rescue him, also got an electric shock. He escaped as the main line tripped for a few seconds. The youth was rushed to Kailash Hospital immediately, where he is stated to be out of danger. P.C. Jha’s 30-year-old son Ashish and daughter Meenakshi were standing in the balcony of their second floor residence when Ashish’s hand touched an 11,000 volt, high-tension wire passing near the balcony. The impact of the current was so strong that he was pulled forward and thrown against the balcony railing. As Meenakshi raised the alarm, P.C. Jha tried to pull his son away. As he came in touch with the powerful electric current, he fell unconscious. Luckily, power tripped for a while from the high voltage cable and they had a providential escape. Earlier, too, a few residents had met with minor accidents because of the power cable almost touching the flats. Mr Jha and his son said residents had brought this to the notice of power department engineers and the Noida Authority but no one had paid any heed to this.